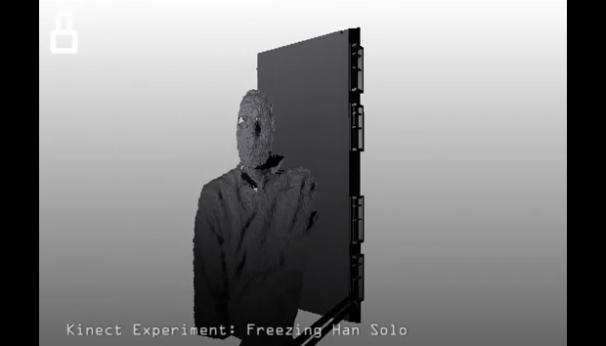 Star Wars fans, rejoice: the Kinect SDK is making the future of your childhood a reality. If you've been following our coverage, you'll know some intrepid coders have already hacked Microsoft's Kinect sensor to capture and stream 3D holographic messages over the Internet and render lightsaber blades in real-time, but now German researcher Michael Zöllner is working on an open-source program that employs the Kinect sensor to capture your body and render it encased in carbonite. Check it out! Even better, Zöllner seems to be developing a method whereby the program exports the 3D model data captured by the Kinect sensor in a format suitable for printing physical 3D models. If he manages to pull it off, you'll soon be capable of capturing yourself in digital carbonite, uploading that data to a 3D printing service like ShapeWays and printing your own custom carbonite conversation piece. Alex Wawro is living in the future, and the future is now.